Terry Fye, Sai Maddali and Franklin Patterson debate during a livestreamed event on March 20. The student body has cast in their votes, and Student Government Association (SGA) elections results are in, but the president has yet to be decided on by voters. Presidential candidates are down to two, as Franklin Patterson and Sai Maddali are competing one last time for the presidential throne. Maddali, a computer science major and president of the Collegiate Entrepreneurs Organization was under the spotlight last week when he violated the SGA Election Commission Code trying to rack up more votes. The presidential hopeful set up a booth inside Patton Hall’s lobby last Monday, which according to Article 4, section 2, subsection 4 of the election code found within SGA bylaws, is not allowed. Gail Sutton, SGA Atlanta campus advisor said Maddali was “given a warning due to an election code violation to due to proximity” to the residence halls. The election commission has since then issued Maddali a warning, and told him to cease and desist. Maddali’s most powerful initiatives include the Panther Career Closet, which would give students access to professional attires for free, for “interviews and career fairs,” as well as environmental sustainability on campus. Maddali takes pride in his work for the communication team behind SGA, and having set up a university-wide video promo, as well as being the association’s largest newsletter contributor. Maddali said he wants to have video chats. In the debate, he vouched for setting up donation boxes in the airport that would go towards the university’s food recovery network, as well as an initiative to set up calendly for advisors to make appointment scheduling an easier process. 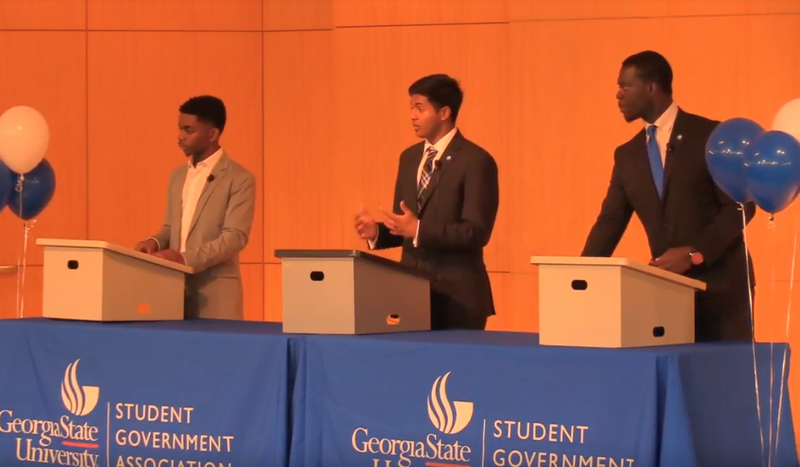 As for Perimeter-transfer Patterson, he used his time during the debates to emphasize the importance of student involvement as well as establishing a Georgia State “culture” that would encourage students to become more involved with student government. “The student voice is dying, decisions are being made without student impact,” Patterson said. “Communication is key. However, one thing that we did do on the Clarkston campus [is] we implemented a suggestion box. If you had a problem, write your suggestion in the box, we’ll read it, call you, get you to speak on the issues that you’re having and trying to get you in front of somebody. That’s something I want to bring to Atlanta. Runoff Election voting will take place on Thursday, April 5. Students will be able to vote on pin.gsu.edu until 11:45 p.m. or stop by a polling station in Library Plaza between 10:00 a.m to 2:00 p.m.
William Solomons contributed to this article.